Im so blessed that i already visited the House of St Arnold Janssen. Not only his House but his place where he is buried. His House is located in Goch, 20 mins driving from my place, and 1 hr driving to his Kloster in Steyl Netherland name under St. Michael Missionhaus . The house of St. Arnold is converted now as a Museum. And the Kloster in Steyl was so nice. I thank frt ciloy, because he is the one invited us to visit there. 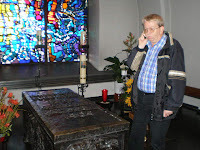 I never imagine that i can touch his coffin and pray inside the church where he lie down to rest. Here are some History about him. The dream of a determined ordinary priest has been realized. November 5, 1837 – Arnold Janssen is born in Goch, Germany. 1849 to 1861 – A time of studies at the minor seminary at Gaesdonck, mathematics and natural sciences at Bonn University, theological studies at Münster. August 15, 1861 – Ordained a priest for the Münster Diocese. 1861 to 1873 – High school teacher of mathematics and natural sciences (Bocholt). 1869 – Director of the Apostleship of Prayer in Münster. 1873 to 1875 – Chaplain for the Ursulin sisters in Kempen. January 1874 – Begins publishing the magazine, Little Messenger of the Sacred Heart. September 8, 1875 – Opens the Mission seminary in Steyl, Netherlands. 1877 – Opens the Mission House for retreats, thus promoting the lay retreat movement. March 2, 1879 – Sends the first two SVD missionaries to China, Fr. John B. Anzer, SVD, and Fr. Joseph Freinademetz, SVD. December 8, 1889 – Co-founds the Missionary Sisters of the Holy Spirit. December 1896 – Co-founds the cloistered sisters, Missionary Sisters Servants of the Holy Spirit of Perpetual Adoration. 1889 to 1909 – Period of expansion of missionary work to Argentina (1889); Togo (1892); Brazil (1895); New Guinea (1896); Chile (1900); U.S.A. (1900); Japan (1906); Paraguay (1908); Philippines (1909). January 15, 1909 – Arnold Janssen dies at Steyl, Netherlands. October 19, 1975 – Arnold Janssen is beatified in Rome by Pope Paul VI. 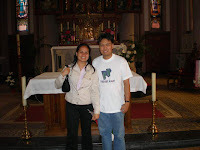 October 5, 2003 – Arnold Janssen is canonized by Pope John Paul II.